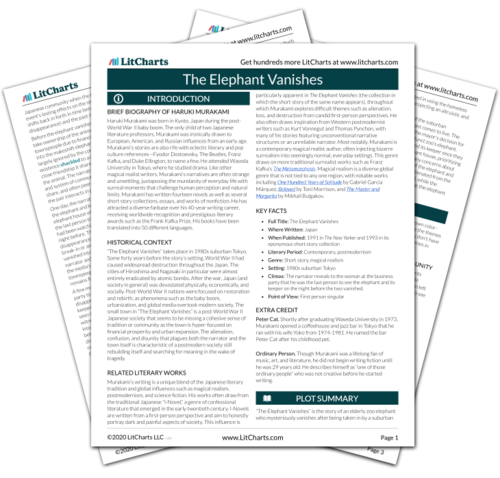 Instant downloads of all 942 LitChart PDFs (including The Elephant Vanishes). Welcome to the LitCharts study guide on Haruki Murakami's The Elephant Vanishes. Created by the original team behind SparkNotes, LitCharts are the world's best literature guides. A concise biography of Haruki Murakami plus historical and literary context for The Elephant Vanishes. A quick-reference summary: The Elephant Vanishes on a single page. In-depth summary and analysis of every of The Elephant Vanishes. Visual theme-tracking, too. Explanations, analysis, and visualizations of The Elephant Vanishes's themes. The Elephant Vanishes's important quotes, sortable by theme, character, or . 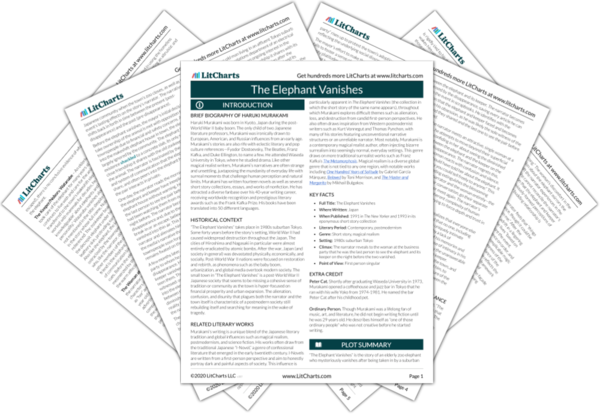 Description, analysis, and timelines for The Elephant Vanishes's characters. Explanations of The Elephant Vanishes's symbols, and tracking of where they appear. An interactive data visualization of The Elephant Vanishes's plot and themes. Haruki Murakami was born in Kyoto, Japan during the post-World War II baby boom. The only child of two Japanese literature professors, Murakami was ironically drawn to European, American, and Russian influences from an early age. Murakami’s stories are also rife with eclectic literary and pop culture references—Fyodor Dostoevsky, The Beatles, Franz Kafka, and Duke Ellington, to name a few. He attended Waseda University in Tokyo, where he studied drama. Like other magical realist writers, Murakami’s narratives are often strange and unsettling, juxtaposing the mundanity of everyday life with surreal moments that challenge human perception and natural limits. Murakami has written fourteen novels as well as several short story collections, essays, and works of nonfiction. He has attracted a diverse fanbase over his 40-year writing career, receiving worldwide recognition and prestigious literary awards such as the Frank Kafka Prize. His books have been translated into 50 different languages. 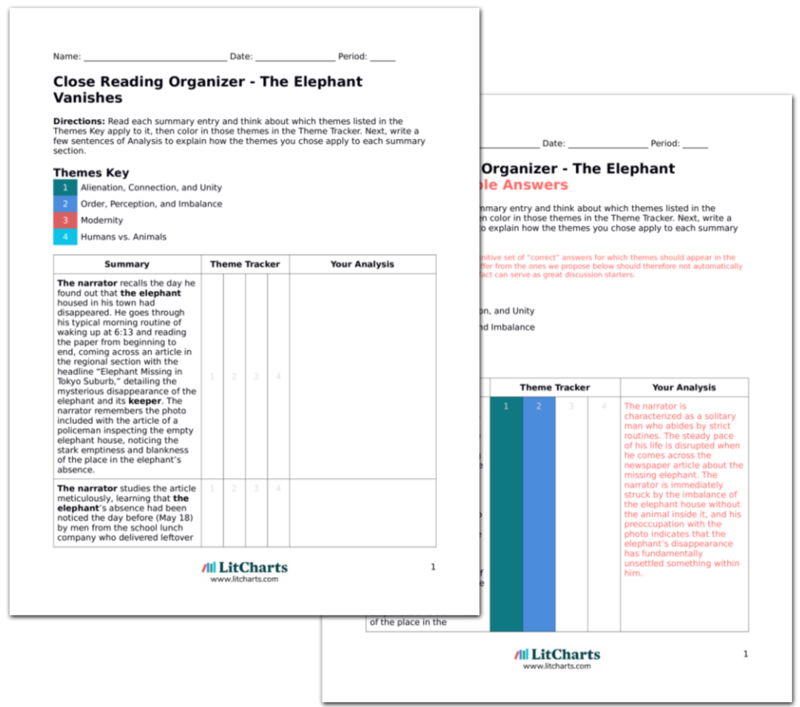 Get the entire The Elephant Vanishes LitChart as a printable PDF. “The Elephant Vanishes” takes place in 1980s suburban Tokyo. Some forty years before the story’s setting, World War II had caused widespread destruction throughout the Japan. The cities of Hiroshima and Nagasaki in particular were almost entirely eradicated by atomic bombs. After the war, Japan (and society in general) was devastated physically, economically, and socially. Post-World War II nations were focused on restoration and rebirth, as phenomena such as the baby boom, urbanization, and global media overtook modern society. The small town in “The Elephant Vanishes” is a post-World War II Japanese society that seems to be missing a cohesive sense of tradition or community as the town is hyper-focused on financial prosperity and urban expansion. The alienation, confusion, and disunity that plagues both the narrator and the town itself is characteristic of a postmodern society still rebuilding itself and searching for meaning in the wake of tragedy. Murakami’s writing is a unique blend of the Japanese literary tradition and global influences such as magical realism, postmodernism, and science fiction. His works often draw from the traditional Japanese “I-Novel,” a genre of confessional literature that emerged in the early twentieth century. I-Novels are written from a first-person perspective and aim to honestly portray dark and painful aspects of society. This influence is particularly apparent in The Elephant Vanishes (the collection in which the short story of the same name appears), throughout which Murakami explores difficult themes such as alienation, loss, and destruction from candid first-person perspectives. He also often draws inspiration from Western postmodernist writers such as Kurt Vonnegut and Thomas Pynchon, with many of his stories featuring unconventional narrative structures or an unreliable narrator. Most notably, Murakami is a contemporary magical realist author, often injecting bizarre surrealism into seemingly normal, everyday settings. This genre draws on more traditional surrealist works such as Franz Kafka’s The Metamorphosis. Magical realism is a diverse global genre that is not tied to any one region, with notable works including One Hundred Years of Solitude by Gabriel García Márquez, Beloved by Toni Morrison, and The Master and Margarita by Mikhail Bulgakov. Climax: The narrator reveals to the woman at the business party that he was the last person to see the elephant and its keeper on the night before the two vanished. Peter Cat. Shortly after graduating Waseda University in 1973, Murakami opened a coffeehouse and jazz bar in Tokyo that he ran with his wife Yoko from 1974-1981. He named the bar Peter Cat after his childhood pet. Ordinary Person. Though Murakami was a lifelong fan of music, art, and literature, he did not begin writing fiction until he was 29 years old. He describes himself as “one of those ordinary people” who was not creative before he started writing. Kunkle, Jenn. "The Elephant Vanishes." LitCharts. LitCharts LLC, 31 Jan 2019. Web. 21 Apr 2019. Kunkle, Jenn. "The Elephant Vanishes." LitCharts LLC, January 31, 2019. Retrieved April 21, 2019. https://www.litcharts.com/lit/the-elephant-vanishes.